What Is DD Form 149? 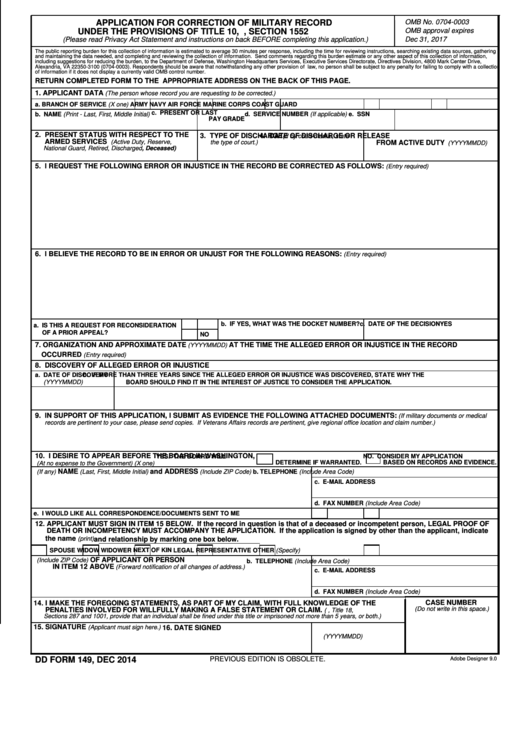 DD Form 149, Application for Correction of Military Record is used to apply for corrections in case if you've discovered a mistake or injustice in your military discharge records. The application is issued by the U.S. Department of Defense but is often incorrectly referred to as the DA Form 149 or VA Form 149. The form's December 2014 revision is in use today - an up-to-date fillable version of the DD 149 is available for download below. If necessary, military records can be changed by the secretary of the military department. Whoever the applicant is - active duty, separated or retired - they can file a request for correction. The application must be submitted within three years after the mistake was discovered. However, if you fail to apply within the prescribed time, the board can excuse the request being late in case they find it to be in the interest of justice. The applicant must give valid reasoning for the delay in filing the DD Form 149. If applying personally is impossible for any reason, a legal representative may represent your interests. The following information is from the Department of Veterans Affairs Guide to Federal Benefits for Veterans and Dependents and is provided as a courtesy. We strongly recommend checking the Department of Veterans Affairs website for the newest information and updates. When filling DD Form 149, note that all information must be typed or printed and be filled completely. If an item is not applicable, enter 'NONE'. If you run out of space on the form, use the 'REMARKS' box for additional information or attach a continuation sheet. All attachments and enclosures are listed in Item 9. Send only copies of all documents related to your request. Keep in mind that they might not be present in your military record. List the correction you want in Item 5. If you can, indicate the exact document or the information you believe to contain errors and the changes you would like to make. Include the reason why you believe the record contains a mistake in Item 6. You can use affidavits or signed witness testimonies, executed under oath, as evidence supporting the application in addition to the documents you attached in Item 9. Remember, you are responsible for securing the evidence for your case. Personal appearance before the Board is not required. But if the board finds this necessary, no expenses will be compensated. Veterans and service organizations furnish counsel without charge. The application must be signed by the applicant. In case that is impossible due to disability or death, the form may be signed by a person authorized to sign for the applicant. In these cases, the proof of death or disability must be attached to the application. Where To Send DD Form 149?